Tablets are the most widely-consumed dosage form in the United States. There are many advantages of taking ginger tablets, but one should always be aware of the properties of the ginger supplements they are taking. Tablets are a blend of active ingredients and excipients compressed into a solid form, usually coated to allow for smooth ingestion and proper absorption. Tablets are compacted using great amounts of pressure, and they are produced in a wide range of sizes, colors, shapes, and even different surface markings. Tablets that are shaped like capsules are called 'caplets'. While ginger tablets contain the active ginger plant compounds, they also contain inactive ingredients called excipients, which give the tablet its desired consistency and help the body absorb the active constituents. Though rare, an allergy to the excipients in drugs and supplements can happen. Sometimes, the allergic reaction is caused by the active ingredient, but it is also possible to have an allergic reaction to the bonding agents that form part of the tablet, usually lactose or wheat. During production, tablets can be modified to control the release rate. However, the ones that have not been deliberately modified nor coated are referred to as immediate-release tablets. It is recommended that adults consume no more than four grams of ginger a day, while a daily dose of one gram should be the limit for pregnant women. Before starting to take ginger tablets, be sure to talk with your doctor about possible ginger side effects and find out the right dosage for you. While ginger tablets are compressed solid dosage forms, ginger root capsules contain a pulverized form of the herb encased in a hard shell made of gelatin, cellulose, or another suitable substance. 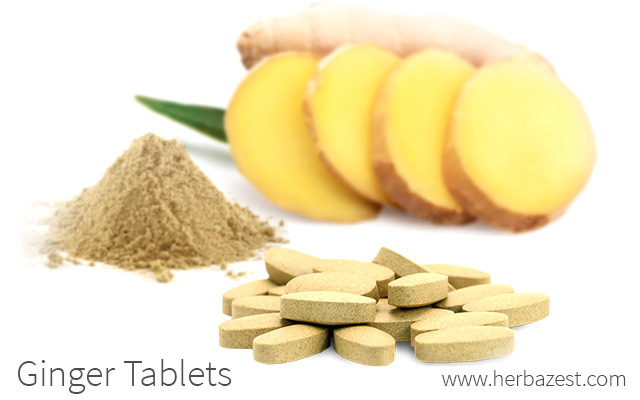 While both tablets and capsules will bring you many ginger health benefits, it should be noted that capsules, lacking the excipients, are a purer form of taking ginger supplements, and there are some allergy concerns associated with the excipients in ginger tablets. While it is rare to have an allergic reaction to an excipient, some cases have been reported. On the other hand, since ginger capsules are one of the purest form of the herb, they usually dissolve faster in the stomach, which may cause of mild gastrointestinal discomfort, while ginger tablets can be designed for prolonged release and gradual absorption, thus reducing the risk of adverse reactions. Finally, ginger tablets can preserve the potency of ginger's active compounds much better than capsules, with an average shelf life of two to three years. Ginger is a potent anti-nausea agent, more effective than dimenhydrinate for easing nausea caused by motion sickness or pregnancy, and the use of ginger for inflammation and pain has proven effective in the treatment of headache, migraine, and arthritis. Taking ginger tablets may also be beneficial for a number of health conditions. Scientific research suggests that ginger may be an important preventative for heart attack and stroke, and also useful in treating heart disease and diabetes, since it has the ability to improve blood sugar balance. Additionally, a relationship between the consumption of ginger and blood pressure levels have been established. In a study published in the Iranian Journal of Pharmaceutical Research (2015), ginger was shown to reduce hypertension, therefore demonstrating its potential against complications of diabetes. Furthermore, taking ginger tablets allows you to access ginger's antioxidant properties, which make it a potential agent for preventing and treating some serious health conditions. Ginger tablet supplements are available at many places, including grocery stores, drugstores, natural food stores, specialized natural health and nutrition stores, general merchandise retail stores, and online. If you are considering supplementing your diet with ginger, ginger tablets may be a good option for you. Their quick release capabilities and wide availability make the health benefits of ginger very easily accessible.